Wow–we’ve been moving right along to get all the bells and whistles here at Red Cape Revolution ready to go for January, and, well, it’s not always easy! There’s a bundle of things still to do . . . getting the membership process just right from the time you hit “Join Us” to the each time you come back to the site . . . adding content to Tips & Scripts and the Info Studio. . . scheduling live calls for you to participate in . . . plus starting a regular process to not only share stories on this blog but to keep track of what you’re saying and what is most important to you!! No wonder I’m ready for a holiday break–and we’re just getting started!! It’s kind of like untangling the Christmas lights, something I seem to need to do every year, even though I try (oh, I try) to put them back carefully at the end of each season. Looking at the clump I had this year, I realized something important: if I put away the holiday stuff all by myself, things usually get shoved in a box. 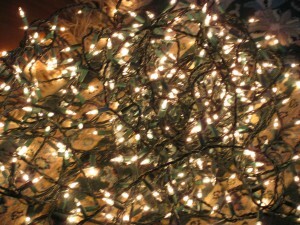 But when I have help, getting things untangled (like lights) goes smoothly and everything gets neatly organized. So thanks in advance for your help and patience as we keep untangling the lights here at Red Cape Revolution. 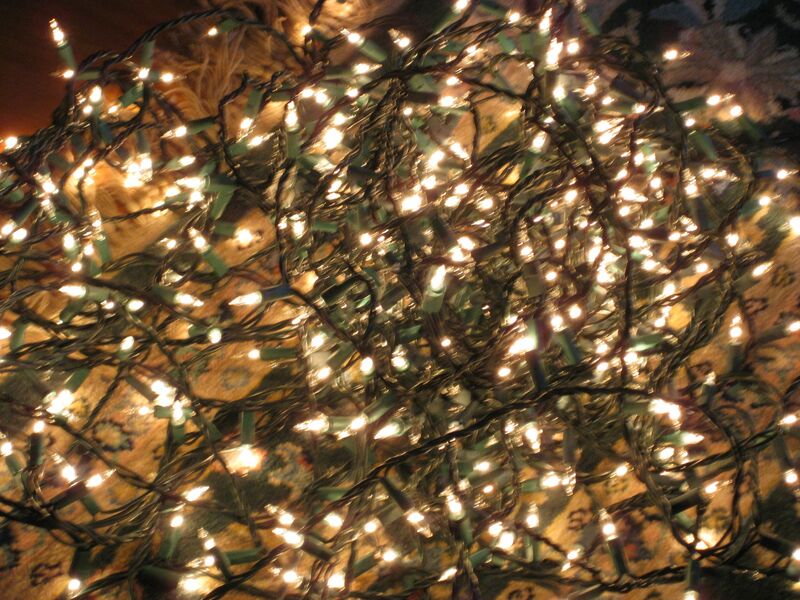 When you come across a “tangle,” please tell us about it here. Red Cape Revolution is a grassroots, ground-up effort, aimed to give you the resources and voice you so deserve to start bringing your superpowers to work and making a difference in your world. We’re working on a shoestring at present, and working hard to get fixes in faster and better! I wish we could just snap our fingers and connect with all of you in an instant (and we’ll come closer to that when we have our Facebook page in place!!). But for now, with your help and holiday spirit, we’ll keep working to get it all right, knowing that when the lights are untangled, they’re quite beautiful.